A typical trip will have you exploring our magnificent coastline and bay while looking for whales, dolphins, sharks, seals and seabirds. Apart from the Southern Right Whales, we are able to view BrydesWhales, Humpback Whales and possibly even Great White Sharks.There are many Cape Fur Seals, African Penguins, Dolphins, Sunfish and plenty of coastal marine birds to been seen whilst out at sea. Before each trip, a brief, informative talk is given on what animals to look out for and the route we will be taking. Each passenger is fitted with a reliable life jacket to ensure safety. On each trip, we drink a toast to “Our Whales” in iced water. We launch from the fishing harbour of Gansbaai and travel along the Cliffs of De Kelders towards the Plaat beach. We want our guest to have a fun yet educational experience. 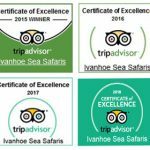 All trips have proficient marine guides on board to answer your questions and share their vast knowledge of the ocean and its creatures with you. Our objective is to adhere to responsible tourism guidelines and the emphasis of all our trips is on the conservation and welfare of these magnificent animals. We offer unique trips that give you the ability to observe some of the ocean’s biggest and enigmatic inhabitants in their natural surroundings.